Up here in Canada, we’re trying to escape the nasty weather by imagining being at Coachella – does it ever look fun! We always love the style inspiration that comes out of Coachella, and this past weekend we have some major fashion goals coming from some of our favorite celebs. You know the place was packed, since Beyonce was performing! Of course a model wouldn’t be afraid to rock a revealing Coachella look, and we don’t blame her! It’s hot out there! We love the combo of a black lace bralette with a patterned, flowing skirt. It’s an easy look to translate into everyday wear – you could even throw a denim jacket on it for some more coverage. Want to try this outfit? We recommend the Smolder Bralette from Blush, which mirror’s Jasmine’s cutouts and is full of black lace. Coachella is one of those places where you can throw caution to the wind and dress how you feel, but sometimes it’s just too much. Victoria Justice picked a fun color-blocked denim dress with some white boots and black accessories, which pulls together for a boho yet approachable look. 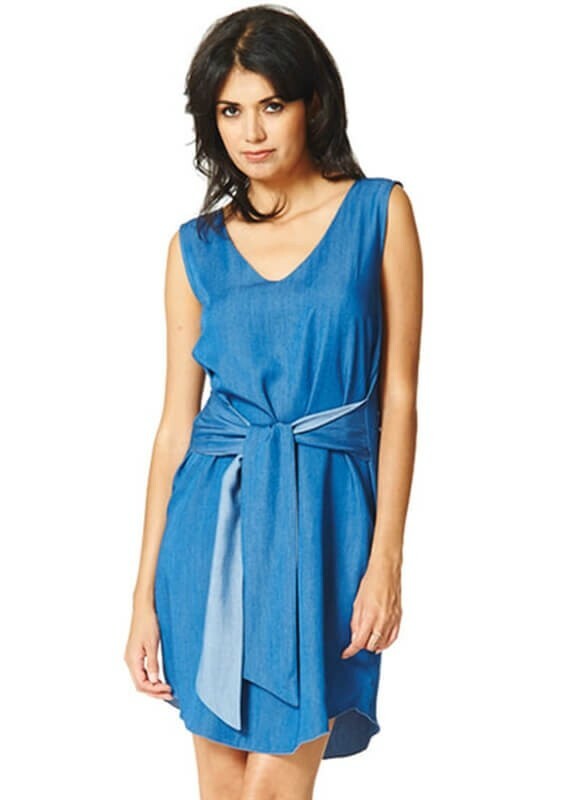 You can easily recreate Victoria’s look with Arianne’s Dylan denim dress. We love us a good sneakers and dress look, and Alessandra combines mesh with lingerie for a cute ensemble perfect for summertime. You could totally rock this look with your swimwear this summer, a fun slip, or go for it in lingerie like the gorgeous model did! Speaking of swimwear, have you seen our new Mod by Parfait pieces? Definitely must-haves to be the most fashionable at the pool. There are certain celebs whom, when Coachella rolls around, we always keep an eye on to see what they wear. Vanessa Hudgens is one of them. She didn’t stray from her boho tendencies, but definitely toned it down quite a bit in an orange floral maxi dress. It’s ethereal and elegant and we’d totally love to own it. Her short hair also looks very cute! Bra tops and bralettes were all the rage at Coachella this year. It makes sense; who needs the extra layers that come with shirts? Hailey Baldwin channeled pin up girl style with her cutesy hair and bold red lips, and her outfit is super modern – a great white lace bralette, some loose high waisted denim, and some white sneakers. Grab your red lipstick and the Elissa bralette from Parfait and you’re good to go! She was on two of the most popular fashion-centric reality shows, so of course, Whitney Port has a keen sense of style. Her combination of summery, vibrant patterns is absolutely expert paired with a soft blue blazer and brown mules. She shows that when you stick to similar color stories, you can put different patterns together and look effortlessly chic. Who wore YOUR favorite Coachella look this year? Follow the biggest fashion trends with us by joining us on Facebook, Twitter, Pinterest, and YouTube.